Forever on the alert, a bald eagle has a prime location for watching the goings-on on Vancouver Island. Bald Eagle, Haliaeetus leucocephalus, in a tree on Vancouver Island, British Columbia, Canada. 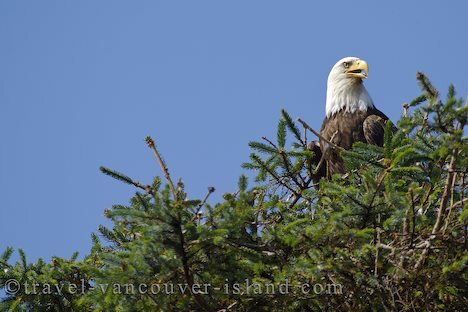 Photo of a majestic bald eagle sitting in a tree on Vancouver Island, BC, Canada.